These days, more and more researchers link our health to our daily surroundings. Take for example, neighborhoods that sit next to freeways exposed to more air pollution. That’s the case for San Francisco’s Bayview neighborhood, which is home to not just freeways, but also some of the city’s dirtiest industries, including a sewage plant. It also has a higher proportion of brownfields and leaky underground fuel tanks than other parts of the city. Because of these sites, Bayview residents have a higher risk of developing asthma and lung cancer. Bayview’s Tracy Zhu is trying to do something about it. When Zhu’s family moved from China to San Francisco they first lived in a SRO in Chinatown. “There were four daughter, my two parents, so there were six of them and soon I was popping out. And then my younger sister, then my brother,” explains Zhu. When she was seven, her family saved enough money and bought a home in San Francisco’s Bayview neighborhood, with a lot more rooms. “There are specific things I remember in the early stages of moving like running into this room and saying I claim this room,” says Zhu. Even though they had more space, she felt isolated in her new neighborhood. “I loved living in the greater Chinatown area because we could walk to Chinatown there were tons of mini-parks everywhere,” says Zhu. Instead, Bayview didn’t have as many things for kids to do or safe places to play, she says. Bayview does have much of the city’s steel manufacturing, junkyards, auto repairs and at one-point slaughterhouses. Zhu didn’t know what to make of these things, until she went to Mount Holyoke College in Western Massachusetts. She was an Environmental Studies major and did things like measure tree height and biomass. Though, it wasn’t until she worked in the City of Holyoke that she started looking at urban environments. “I was working with that community and really understanding the health issues that affected them from the diesel air pollution from the seven different freeways that cut through their neighborhood from the factories that was pumping away,” recalls Zhu. Specifically South Holyoke, formerly a heavy industrial area littered with vacant lots. “That’s when I really understood how we could talk about environmental issues in the urban context that talk about race, class, and immigrant rights and all these other social justice issues,” Zhu says. This realization followed her home, when she returned to Bayview after graduating. “I looked around and said wait a moment my neighborhood is really similar to that of the City of Holyoke. It struck me as so weird that [it] had never occurred to me while I was living here that there was this level of environmental injustices happening in my neighborhood,” says Zhu. Zhu wanted to do something that would engage people in addressing the environmental problems in her neighborhood. 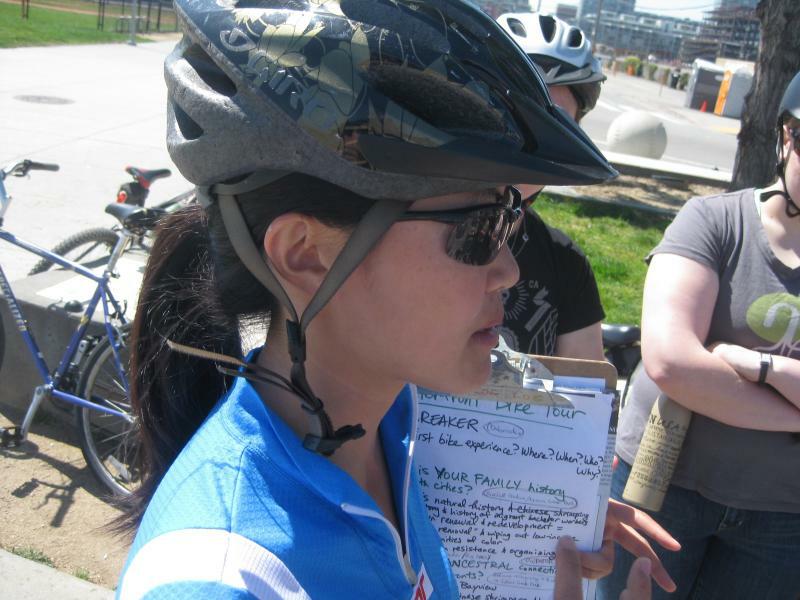 So she started leading “toxic tours” – bike tours of San Francisco that guide people right up to examples of current pollution sources and past problems. “I’m going to try to highlight what can we incorporate or what can we think about these histories and incorporate people in an empowering way such that we don’t replicate the same problems throughout history,” Zhu says that’s the goal. On a sunny Saturday morning in San Francisco, Zhu leads a group of ten women on bikes up to one example. They come to a stop at Illinois Street in the Dog Patch. Old wooden shack-like structures sandwich between massive dilapidated buildings fashioning broken windows, graffiti, and rust block the view of the Bay. Behind a barbed wire fence sits the block-sized remnants of the Pacific Coast Steel Company. You can almost imagine what once was a bustling port. Right across the street modern and sleek condos juxtaposes the old with the new world. “So we have this dichotomy between decaying industrial city some of it still in use and sprinkled here and there some parks,” explains Zhu. As the cyclists examine the area, Zhu asks the group to think about all of the warehouses surrounding them. “What I want to emphasize is warehouse district. What comes along with these warehouses? Trucks! Diesel trucks!” says Zhu. “While most of our air pollution comes from cars it’s like 75 percent most of the cancer risks comes from diesel air pollution and in addition to that diesel air pollution sources like warehouses, trucks, truck depots, the postal office, the ports, airplanes, train depots they’re mostly located next to low-income communities of color,” says Zhu. This is the kind of situation Zhu hopes to prevent in the future. The next stop on the tour shows how a group of local residents came together to turn an environmental wasteland into a community resource. They arrive at Heron’s Head Park, where the city’s first off-the-grid sewage and electric site – The EcoCenter – sits on top of a small hill. Zhu worked here when it first opened. Inside the group stands in front of a chest-high glass tank filled with green algae filtering wastewater. This all happened because nearby residents rallied together to do something about an abandoned site. “In this particular neighborhood folks were saying to the Port, hey this is a brownfield. This is a contaminated site. You have to do something with it. Either dig it up and throw it away or make it into something useful. And as an environmental justice community folks in the neighborhood said well digging it up and throwing it away will not really get rid of this contamination, you know. It will just be someone else’s problem,” says Zhu. First community members restored the natural wetlands and created Heron’s Head Park then the EcoCenter, to promote environmental conservation. Zhu considers this a community victory. Through the EcoCenter window you can see another one – remnants of an only PG&E power plant. “If you look behind the electrical transformers that are still there. What do you guys see on that hill?” aks Zhu. “Housing!” the cyclists say in unison. “Housing, yup. It’s mostly affordable housing but there’s single-family homes and cooperative-owned homes,” says Zhu. Toxic inventories of the area found soil and groundwater contaminated with harmful chemicals from the plant, shipbuilding, and other activities on the land throughout the years. After mounting community pressure, PG&E closed the plant in 2006. Today PG&E continues to clean up contaminants in the area. “So this has been a huge environmental justice success of shutting it down,” says Zhu. The EcoCenter is the last stop on the tour, but the group carries on for a final ride down Third Street. Zhu’s tours show how industry and development play huge roles in shaping the neighborhoods we live in. But they also prove that people, shape them too. “You know how do you love your space, love your environment enough and understand it enough to get to the point of wanting to stand up for it and wanting to be a voice for your neighborhood or community,” says Zhu. She hopes to do this by one day becoming an urban planner. For now she stays involved with the EcoCenter and other environmental groups with the hopes of getting people to create equitable, healthy, and safe neighborhoods. Do you know someone who’s trying to improve environmental and health conditions in their your neighborhood. Tell us about them on our tip line – (415) 264-7106. This story is a part of the Sights and Sounds of Bayview Project – a collaboration between KALW and the San Francisco Arts Commission to tell the stories of people making positive change in the Bayview. Come hear more about them on Thursday, September 19 at 7pm at the Bayview Opera House. Find more details here. 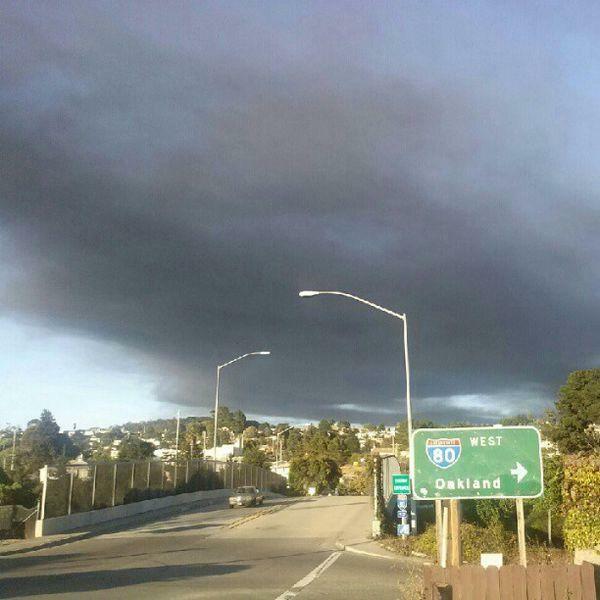 Last month’s explosion at the Chevron oil refinery in Richmond had the East Bay in shock. San Francisco’s Bayview Hunters Point neighborhood has higher rates of poverty, unemployment, and violence than any other part of the city. But its relative geographical isolation – it’s cut off by the 101 and 280 freeways – can make those issues all but invisible to residents of other neighborhoods.